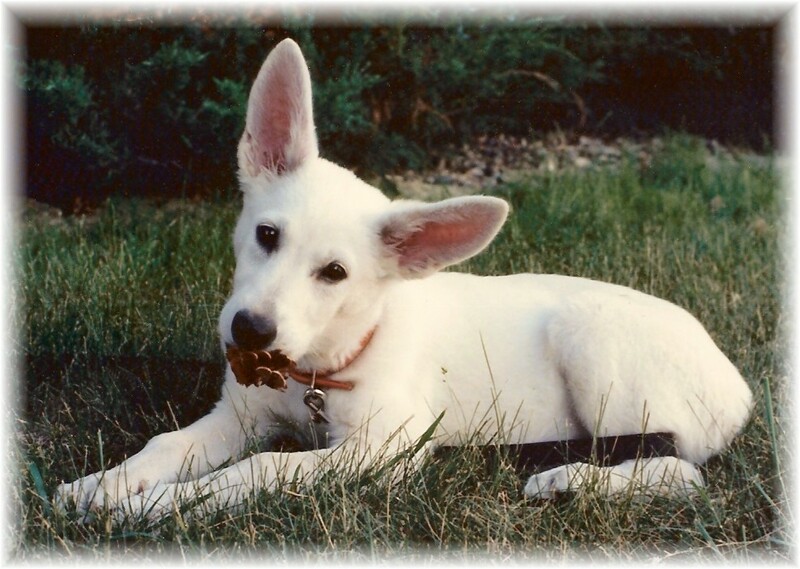 Sedona was one of three whites and five black and tan pups born to Sire: Sherwood Sam (black and tan police K-9/Topeka, KS) and Dam: June Von Murray (white). Because Sam was a white factored black and tan, bred to June (white) they produced this white and standard coated litter. If both sire and dam were white, their puppies would always be white! If two colored German Shepherds carry the white recessive gene and are bred together, they will have at least one or more white pups in their litter. Both parents have to carry the white gene before producing any white puppies. Sedona was always the clown in our family, and acted much like a puppy most of the time. She was a delight to have around…she helped much in the house by retrieving items, or just protecting us if needed. She was very loving to our family, and truly loved life. Sedona earned her working titles with good scores. I was very proud of her accomplishments. I planned only two litters with Sedona (same stud) WGSDCII/WGSDCA CH Regalwise O’Leavy Czar, CD, OFA. Sedona was a fantastic mom! One of her progeny from her first litter in 1991 became a certified PD1 and Narcotics police K-9 named JoKay’s Fenris Von Wolf, 13 Club aka Bart. His trainer/partner was Officer William R. Lundquist in Minneapolis, MN. Bart and Lundquist worked together for five years until their retirement. Sedona also produced other obedience titled dogs, breed dogs and many wonderful pet-companions. Sedona loved tracking and had become very good at it – sorry to say I never titled her in that. I was blessed with such a wonderful friend and companion. Later on in the Art-toon series, there was another German Shepherd that was introduced along with Sedona. His name is Otto. Otto was created from the image of my husband Joe’s dog U-CD JoKay’s Czardona Weiss Lobo CD, CGC, 13 club aka Lobo, is one of seven born in Sedona’s first litter on June 7, 1991. Lobo’s white coat was then altered into a black sable – creating Sedona’s Art-toon partner Otto. …Otto can be quite annoying at times, but Sedona always gets the last word in. 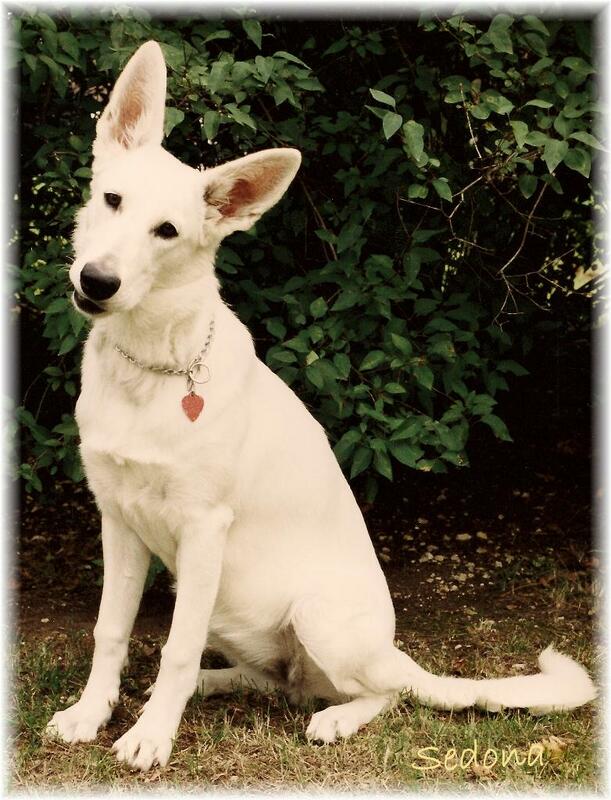 Sedona’s Art-toons have become a very popular icon in the white German Shepherd Dog world. 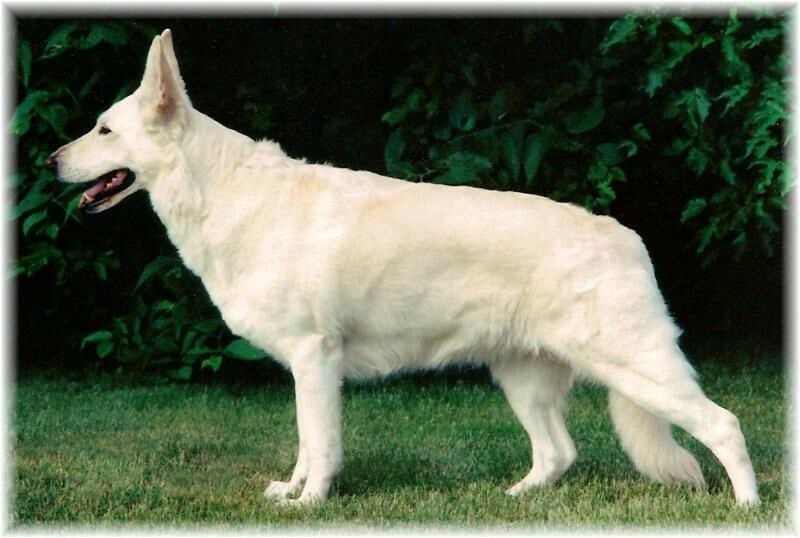 They have been published in the White German Shepherd Annuals by Hoflin Publishing out of Golden Ridge, CO since 1993. The Art-toons have been seen throughout the United States/Canada, and in Germany, Switzerland, England, Holland, France and South Africa. Faithfully, cherish and love them everyday they are with us.